There have been a few Star Wars themed speakers over the years but few quite as visually impressive as the first duo of Bluetooth loudspeakers from British audio firm AC Worldwide. It revealed to Pocket-lint that it will be releasing additional models in the range, designed around Darth Vader and star of the Halo games Master Chief, and if they are any bit as visually stunning as the two already available, we're in for a treat. The first two are based on the heads of C-3PO and a Stormtrooper from the first trilogy rather than the Force Awakens design. The C-3PO is life-sized, at 30cm high, and an awesome sight. The Stormtrooper helmet is fractionally smaller at 28mm and is therefore three-quarters the size of the real thing. It is equally striking, however. Inside each speaker is a 2.1 audio system. There are two tweeters, sited behind each eye of the respective models. They are capable of outputting 3W apiece. There is also a down-firing ported 15W subwoofer to give that extra growl. The eyes also glow blue when you have connected a Bluetooth device - be that a smartphone or tablet. You'll also get a related phrase, with C-3PO stating "I do believe they think I'm some sort of god" from Return of the Jedi. The Stormtrooper simply barks "move along" after pairing. NFC pairing is available for those with supporting devices. There's also an auxiliary port to connect a wired audio source, such as a games console. Both speakers have rechargeable batteries so can be placed anywhere, although it's worth considering that each of them weighs 2.3kg. Battery life is claimed to be four to five hours of playback on a charge. The charge time is claimed to take around two to three hours to fully restore it. If you opt for both speakers, they can be paired to make a stereo system. Although we didn't get much of a chance to hear either speaker in action during out brief demo, we will be reviewing one of them in full in the near future. They are very capable in volume though, that much was apparent and they are incredible looking - enough to make every Star Wars fan out there to salivate over. 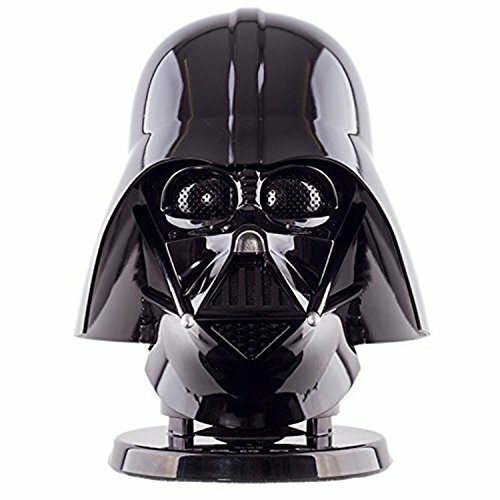 The Star Wars Bluetooth speakers are available from retailers such as Amazon, Forbidden Planet and The Fowdry for £149 each.